Do you ever have one of those days where you can't wipe the smile off your face? Yesterday was one of those days. 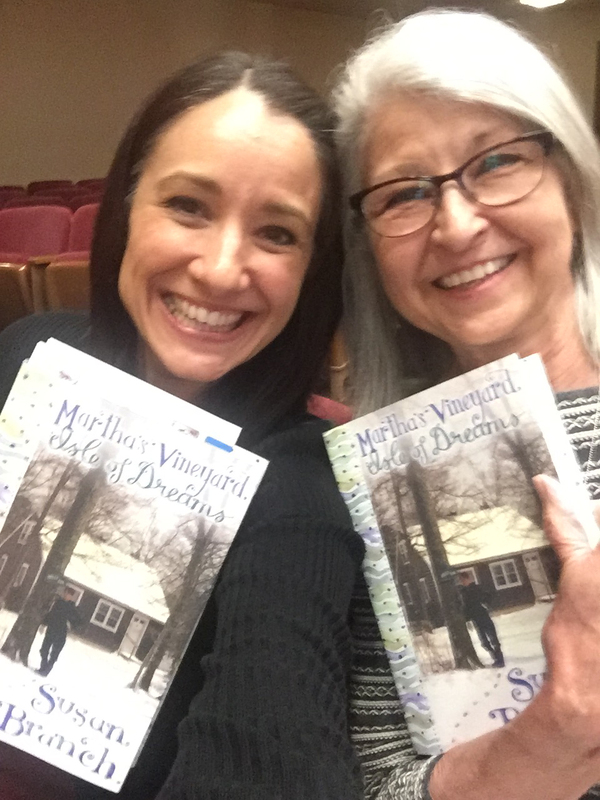 My daughter, Amber, and I spent the day together shopping, having lunch on the Plaza in KC, and then we (drum roll please) went to hear Susan Branch talk about her new book, Martha's Vineyard Isle of Dreams. 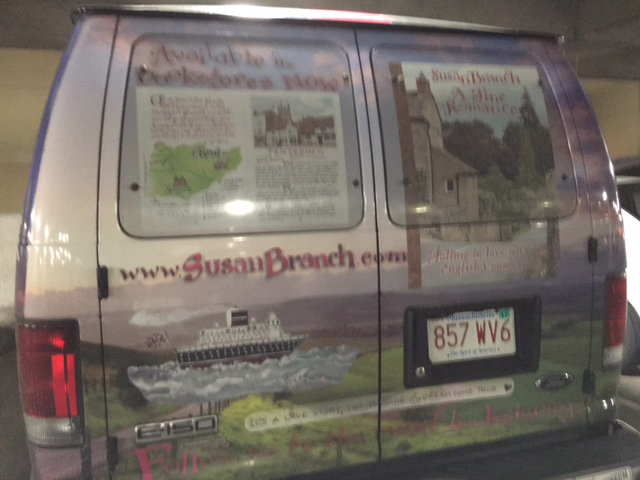 I have been a huge Susan Branch fan for years! I have so many of her books: Sweets to the Sweet, Vineyard Seasons, Christmas Joy, The Summer Book, A Fine Romance, Fairy Tale Girl, Girlfriends Forever(I've given this one as gifts too), and now this new one! I've been charmed by Susan's artwork from the first time I saw her illustrated recipes in a magazine (I can't remember if it was Country Living or Country Home). I used to tear them out and save them. Then I got hooked on her handwritten and illustrated books and calendars. The new one is very special because it's now autographed and because we got to meet Susan and her husband, Joe. 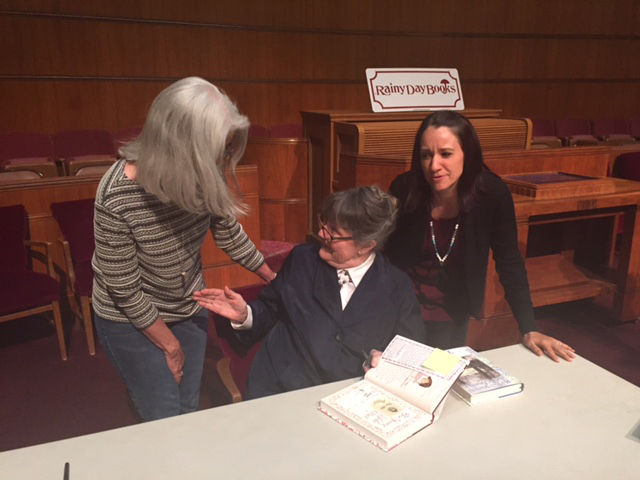 Amber looks a little jealous that Susan is extending her hand to me. Not sure what that look is all about, but we both thought it was funny, so I'm sharing it! 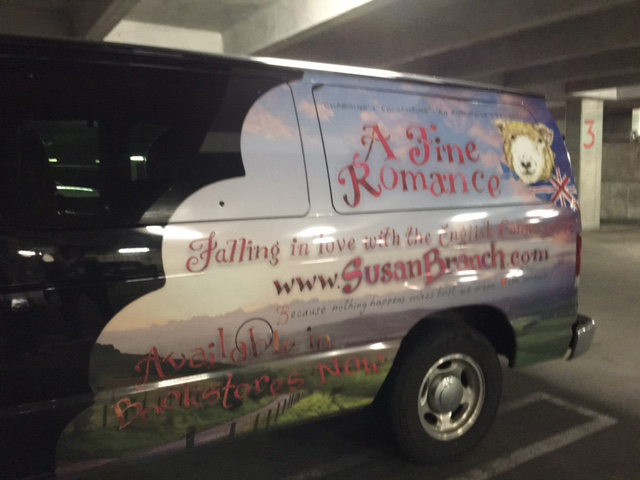 I hunted outside for their van before we entered the building and couldn't find it. Joe was kind enough to tell us where it was parked so we could take pictures. They are traveling the country on their book tour in this beauty! I've seen it on Susan's blog which you should definitely read. Also, go to her website and sign up for her newsletter Willard. 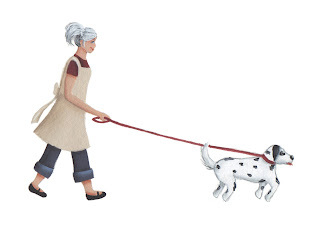 I adore the whistling birds on her website! Sorry about the pictures of the van, but I have a new cell phone and still learning to use that camera. Such a fabulous day! Thanks Amber! 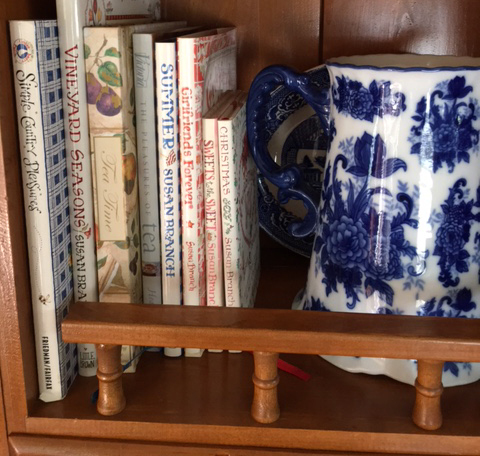 Here's a few of my Susan Branch collection along with a few other favorites on my hutch. There is so much going on at our home recently and I will share it all with you soon hopefully! 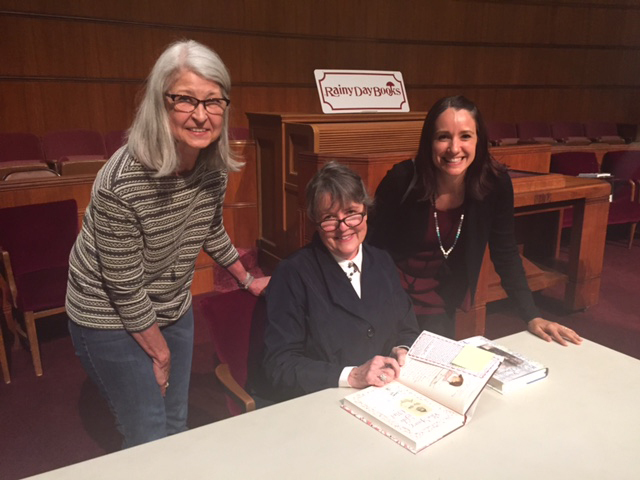 What a happy day and to spend it with your daughter with a highlight of seeing Susan and actually meeting her! You are blessed. How exciting for you! I plan to take a trip to have the chance to meet Susan at the end of June! I hope that van is up for all this traveling across the country! I've been a fan for a number of years! My sister and I were so sad we missed her K.C. stop! Love her handwritten & illustrated books too! Especially the last 3 of her life!